Nepal is a multi-ethnic, multilingual, multi-religious and multi-cultural country. There are 59 indigenous peoples in Nepal. Of them, Limbu indigenous peoples are the one who have their own distinct language having a long written tradition. Despite the long written tradition of the Limbu language, it has been confronting problems in using it mainly in education, communication and official work. It would be relevant to discuss each of them in brief. Nepal’s constitution 1991 had a provision that each community can impart education in their own mother tongue up to primary level. The Nepal’s Interim Constitution 2006 has also made similar but clearer provision than that of the Constitution 1991. The provision stipulates, ‘Each community has rights to get Fundamental Education through their own mother tongue’. Education for class one to eight is being defined fundamental education in National Curriculum Framework 2063. The article 28.3 of ILO Convention 169 (ratified by Napal) and article 14 of UNDRIP (voted for adoption by Nepal) articulate indigenous peoples have the rights to get education through their own mother tongue. Limbu language along with other mother tongues has been included in primary school curriculum. However, these provision and the rights have not yet been properly implemented resulting in deprivation of indigenous peoples to get quality education. Radio Nepal has started to broadcast news in Limbu language for 5 minutes every day through its Regional Broadcasting Centre, Dhankuta since 2051. Later it has started to broadcast educational program for 30 minutes in Limbu language once in a week. This is a pity state of Limbu language use in electronic media owned by the government where most of the listeners of the regional broadcasting centre, are the Limbu language speakers. In addition, there are not any programs in television in Limbu language. However, Limbu indigenous peoples themselves have taken initiatives to conduct programs in Limbu language in community owned FM radios established in the eastern part of Nepal. Nepal’s Interim Constitution 2006 article 5(1) states, “All mother tongues spoken in Nepal are language of nation.” But the article 5 (2) of the constitution stipulates that only Nepali language written in Devanagari script shall be the official language. It, however, further says that apart from Nepali language, the use of mother tongues in local government offices can be exercised and not be considered illegal. The government of Nepal also includes policy regarding the use of mother tongue in local government and offices in its annual policy and programs of this year. This has provided some rooms in government offices to the use of mother tongue. Some basic works has been done in the field of education and communication but nothing has been worked with the use of Limbu language in official work. There is lack of basic requirements to be used for using of Limbu language in official work. The government office staffs are still reluctant and hesitate towards internalizing the use of mother tongue in office. There is lack of Limbu language speaker staffs. All public notice of government offices are broadcasted and published in Nepali language which has never provided clear message to the Limbu language speakers. Even Limbu language speakers are not aware that their language can be used in office in addition to Nepali Language as official language because they have not allowed doing so for years. The proposed project will address all these problems to introduce Limbu language in local government offices as an official language. Limbu language is used as an official language. 3. to make aware Limbu language speakers on linguistic rights prevalent in the constitution, laws and international instruments. Total population of Limbu language speakers is 3,33,633. However, there are differences among them in using the language. There is a great number of illiterate Limbus who speaks Limbu language but can not read and write it. They are deprived of opportunity and of facilities provided by the state. Moreover, they face problems such as loss of property and punishment due to a mere misunderstanding of languages used in government offices. Therefore, the beneficiaries of the project will be illiterate Limbu language speakers. Limited financial resources, in terms of needs, will be mobilized for the implementation of the project. The native approach will be incorporated looking at the need and learning attitude of the Limbus. Limbu teachers in schools, media persons and individuals involved in different professions who have been devoting themselves for the promotion of Limbu language will be the part of the project’s activities. Keeping this very situation in mind, the project will make conducive environment for their convenience as well as incorporate native way of learning and teaching which must be deep rooted to the Limbu culture. So, Being Limbus as indigenous peoples has firm belief that the teaching and learning will be effective if incorporated with the way of learning approach that is latent in their culture. So, native learning process, geometrical growth process, skill standardization and lobbying/advocacy will be adopted as means of the Limbu Language promotion project. The Limbus have their own traditional learning approach. The approach is specially adopted by the Saman/priest of the Limbus called Phedangma, Samba, and Yeba/Yema of the Limbus. The teacher (Saman) adopt the approach to make their disciple perfect to recite long Limbus’ scripture ‘Mundum’ orally and to follow performance of rituals. In this approach, disciples also plays role as an assistant to his teachers during the performance of rituals. Apart from performing rituals, the teachers and disciples make any favorable situation and time to carry out teaching and learning of the Mundhum. So, this way of learning process is deep rooted to Limbus’ heart and mind. The approach is also effective in the project of Limbu language promotion campaign. Training/workshop on writing of Limbu language will be organized with the participation of Limbu language teachers of primary schools, facilitators of non formal education of Limbu language, and Limbu language media persons and individuals devoted to the upliftment of the Limbu language. They will be considered first group of Limbu Language Promoters (LLP) of the project. After participating in the training, each promoter will have to find and make at least three disciples in their own initiative. Likewise, the disciples after becoming promoters will make also three disciples. This process will be carried out by promoters continuously in their own initiatives. However, Kirat Yakthung Chumlung will facilitate and monitor their work and also organize constructive programs time to time in their active participation. At the end of the project, skill of the promoters is measured or tested adopting various methods. 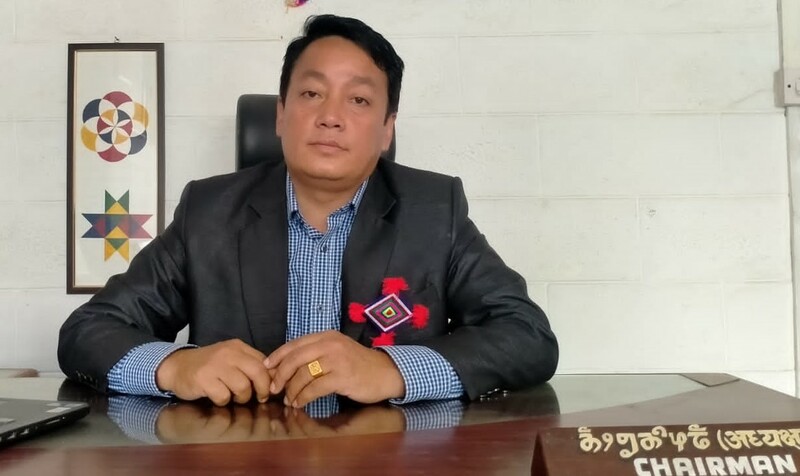 For this, Kirat Yakthung Chumlung will form a Limbu Language Standardization Committee comprising experienced person in the field of education and Limbu language expert. The committee will develop necessary process for the skill test of the promoters. Kirat Yakthung Chumlung, on recommendation of the committee, will distribute certificate to the successful promoters. The certificate will be distributed in such a way that it will aid some support to the educational qualification of the promoters and it will also get recognition from government and non-governmental organization. This work of distributing certificate will encourage new persons to become Limbu Language Promoter which is essential for the continuation of promotion of the Limbu language after the completion of the project. Lobbying is needed to carry out to make government office staffs for creating conducive environment to use limbu language in official work. Currently, there are none of the staffs able to understand Limbu language. For the time being, government offices need to hire Limbu language interpreters. The Limbu language promoters can be worked as interpreters in the government offices. The notice board and signboard are needed to be kept for Limbu language. Public notice through FM radios must be broadcasted in Limbu language. At the same time Limbu indigenous peoples are made to be empowered to use Limbu languages in government offices since they are being discouraged to use their mother tongue in government offices. 5.5 Broadcasted public notice by local government offices in Limbu language. 6.5 Lobbying for keeping signboard and notice board in Limbu language and script to local government, line agency and other stakeholders in their offices. Kirat Yakthung Chumlung’s secretariat involves directly to the implementation of the project. The secretariat will form a management team to implement the project. The management team will follow the norms of gender balance of the organization and will ensure to equal participation of both genders- male and female in the projects activities. Limbu language speakers freely complete their necessary work in government offices in their own mother tongue. Limbu language speakers get advertisement of different subject matter including important official information through FM radios of their locality in their own language. The local government offices hire Limbu language interpreter, keep signboard and notice board in Limbu language with scripts to provide effective facilities. This also paves the way to create permanent job in government offices for those who is capable to communicate in Limbu language. The Limbu Language Promoters can compete for the job. In the long run, Limbu indigenous peoples will not be victimized by state due to their inability to misunderstanding of languages used in government office and they will also feel psychologically free to enter in government offices for their official work. Manual with format will be developed and published. There are increased numbers of Limbu Language promoters. Airing of news in FM radios, publication of news in newspaper, formation of Limbu Language Standardization Committee, document of the committees, report prepared after completion of each activities, final report submitted to trust fund, responses to participants, Limbu Language Promoters, stakeholders and beneficiaries helps to measure the effective implementation of means of the project. Nepal government has allocated certain amount of money to local government viz District Development Committee (DDC) and Village Development Committee (VDC) for the development of indigenous peoples. Non governmental organizations are also interested in working for the development of Indigenous peoples’ languages. For the continuation of the project as a campaign, Kirat Yakthung Chumlung’s District and Village committees will submit project proposal to District and Village Development Committees. Similarly, financial support will be sought from National Foundation for Development of Indigenous Nationalities (NFDIN). After approval of providing financial support, a separate fund will be established from the support for the Limbu language promotion campaign. The organization will mobilize its own members and staffs at district and village level as well as Limbu language promoters to complete Limbu language promotion project in limited resources and time. In addition, the organization will facilitate Limbu Language Promoters for the encouragement and for the improvement of their capability. After completion of the project, Kirat Yakthung Chumlung will continue it as a campaign with the support of the Limbu Language Promoters. In local, district and national level, coordinated work will be carried out with local agency, administration and other stakeholders for making the use of Limbu language as an official language. The monitoring will be done by the secretariat of the KYC. In addition, donor agency and main stakeholders viz. NEFIN and NFDIN will monitor the project as required. It is required to send report including records of the Limbu Language Promoters’ performance by Promoters themselves to the project team with the support of district branch committees of KYC where a person in each districts is given responsibility to facilitates Limbu Language Promoters in their respective district. The project team will have the responsibility to prepare reports. The secretariat will document and distribute the report prepared by the project team after finalizing it. A separate and workable monitoring system need to be developed for the project since its activities, mainly teaching and learning, are carried out by Limbu Language Promoters in individual basis (they will not paid for this as well) keeping their convenience.